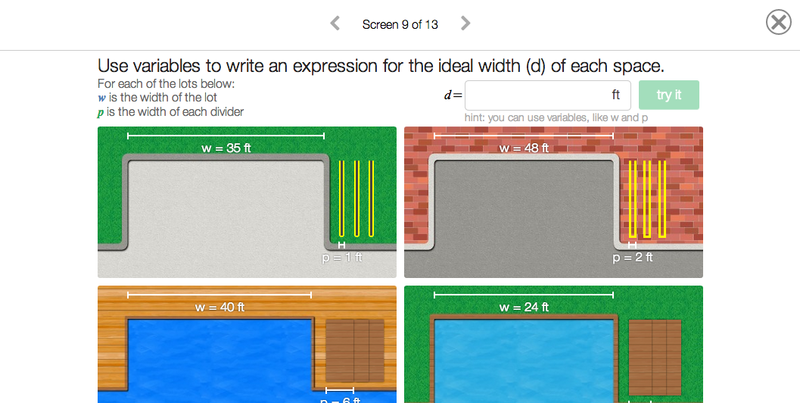 First, a huge thanks goes to Desmos for creating awesome lessons. 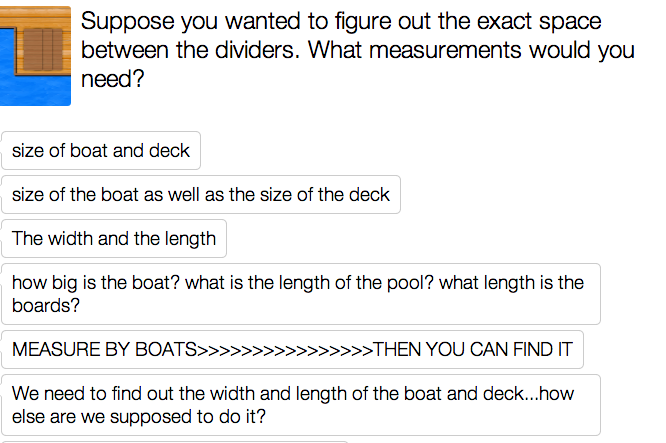 I can’t believe this is the first time I’ve had students using a lesson from teacher.desmos.com, and it was awesome. If you haven’t checked it out, go right now. Seriously, walk through a lesson. Anyway, we have a new Chromebook system this year, so class started off with students setting up their accounts. First class especially was slow as I was figuring the system out at the same time my students were; second two went much better. It would’ve been better to have a full period, but the accounts needed to be set up and, as I’ll outline later, it ended up being an effective amount of time. I opened up the teacher dashboard on the projector and left it up the whole class; I was a bit nervous about this making kids anxious about their work being public but they were all pretty engrossed in the lesson, and it made it much easier to quickly stop the class and respond to what I was seeing. First issue: Many students were guessing and checking, rather than calculating, to answer the second round of questions.The two screenshots below are telling, with students answer to the left (names are cut off): note that, while the exact answer to the first question is 10.5, 10 works as well because the cars have a bit of room to spare. I realized after the first class that this was a key moment in the lesson. I pulled this group together later in the class to do some thinking about the expressions, but at that point I was trying to put out fires; by guessing and checking their way through the problems rather than working out the math, they were set up to be frustrated when asked to write an expression. The difference here was that, after about half of the students had gotten to this stage, I stopped the class and had students share their strategies. They quickly converged on the algebraic strategy — many of the answers you see there came after the discussion, and students saw the patterns. but for this class it was doable by trying independently, sharing ideas, and then trying again on their own; with my first two classes, I had to walk them through the whole thing just to get part of the class there; I don’t think I did much that was meaningful for their understanding. This was really telling for where my students are in terms of being able to understand and use variables. We have a ton of work to do, and this lesson, while I think some students learned valuable lessons, was mostly a lesson for me in exactly where my students are, and how far we have to get this year. I think this is the biggest indicator that students’ algebraic understanding is lacking — seems to me like they view math (and the world) as a series of measurements and arithmetic problems, not as unknowns and relationships between them. Maybe I’m reading too far into this, but I’m pretty fascinated at that disconnect, and not sure how best to teach it. Anyway, thanks Desmos for a great lesson — can’t wait to roll out Function Carnival in a few weeks! This entry was posted in Uncategorized on October 6, 2014 by dkane47. Thanks for your honest reflection here. Very helpful as I plan to use this in my class!